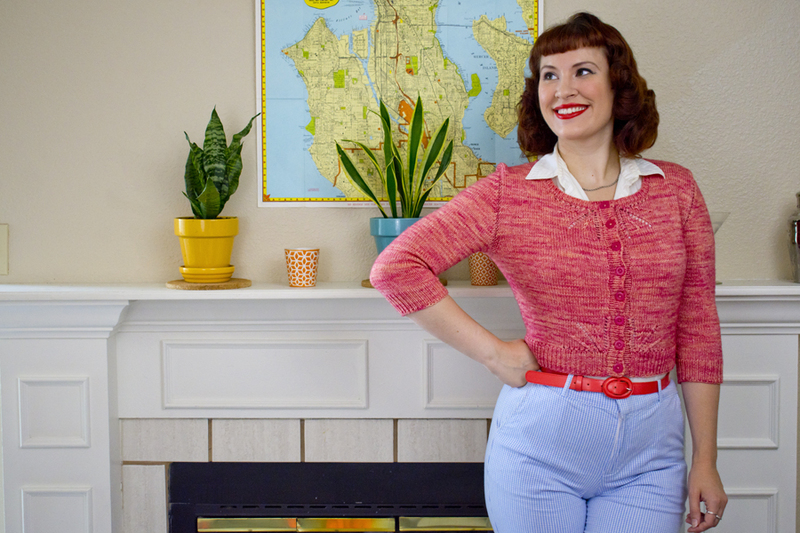 You’ve seen this fine cardigan from sketch to sweater, and I’m delighted to announce that it’s our Fall KAL project! We’re knitting Populuxe starting September 1st, over in the Untangling Knots group on Ravelry. 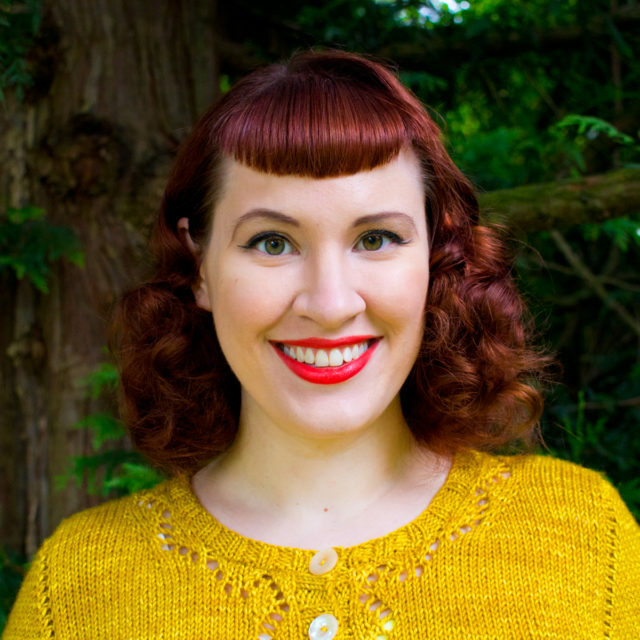 The KAL will run through November 1st, giving a generous amount of time to knit your own. Populuxe was inspired by and named after midcentury design. The sunburst motifs on the upper back and fronts were inspired by sunburst clocks and mirrors, a popular design in the 50s and 60s, and “populuxe” is the name of an aesthetic and design trend from the same period that mashes up “popular” and “luxury,” drawing from the idea that modern style should be available for everyone to purchase, even if it was just at a drive-in with futuristic neon and slick signage. I don’t always have such a clear source of inspiration for my knitting patterns, and this particular one made getting the right photos tricky. I originally styled this cardigan with a dress covered in flowers and took photos outdoors, at my aunt and uncle’s house. They were nice enough, but they were so far removed from my very retro concept that they simply didn’t feel right. So I did some plotting, dug through my wardrobe for alternative styling options, and took the final pattern photos in my new apartment. Both sets of photos show off different aspects of my personal style, and both feature things I enjoy — plants and cocktails — but I feel like the newer photos evoke the feeling I was going for much better. 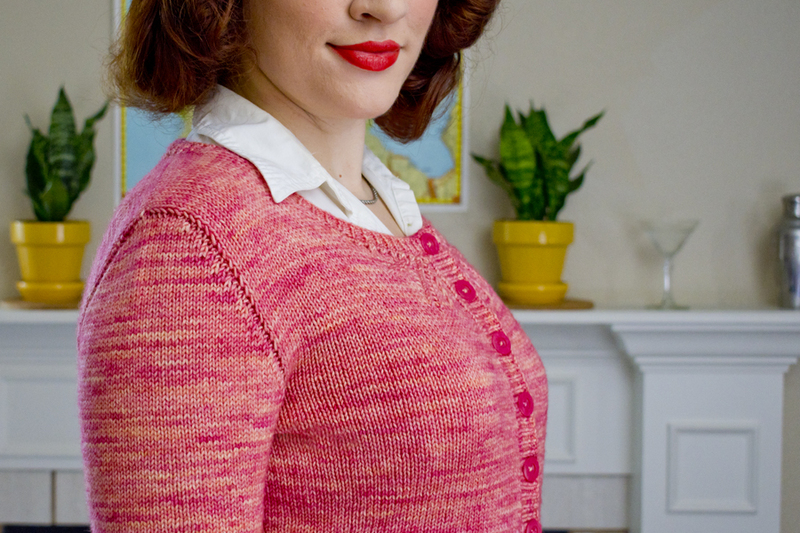 The cardigan is worked seamlessly from the top-down, using my favorite short-row, set-in sleeve method. It’s knit using Hazel Knits DK Lively, a DK-weight wool and nylon blend. 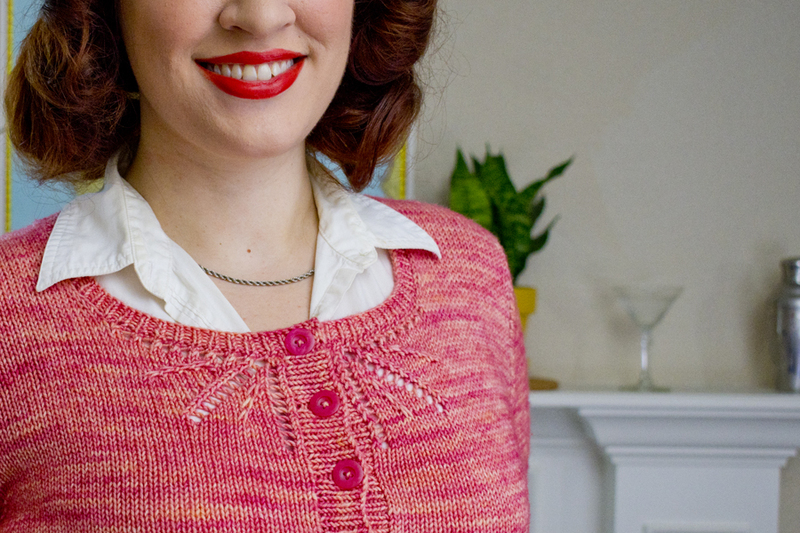 After wearing through the elbows of many sweaters in the past two years, I’ve got a renewed interest in hard-wearing yarn, and this is one I particularly like. The nylon content gives it a little extra strength without changing how the wool behaves, and a 100% wool DK-weight yarn can also be substituted. The pattern comes in seven sizes, and fits best with zero ease or a pinch of negative ease. 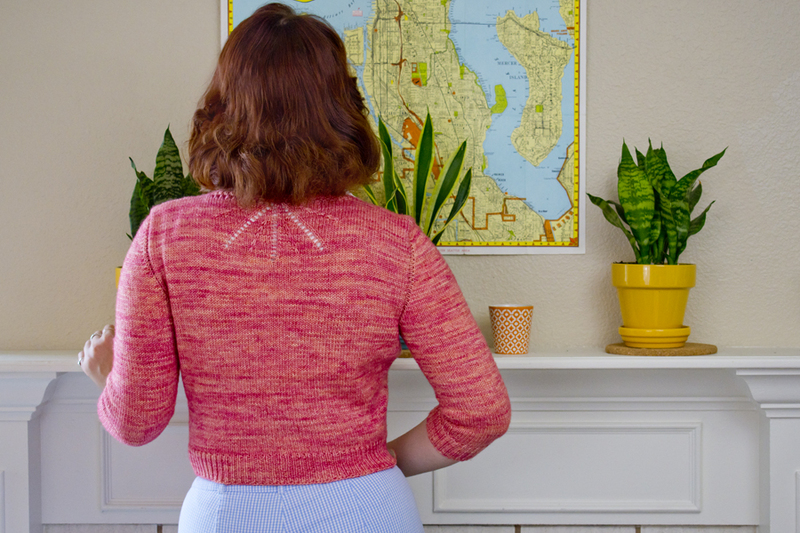 Buy yourself a copy of the pattern on Ravelry using the coupon code POPULUXEKAL to get 20% off, and hop on over to the Untangling Knots group to join us for the KAL! The cast-on date is September 1st, but you can start sharing your ideas for color and yarn at any time. 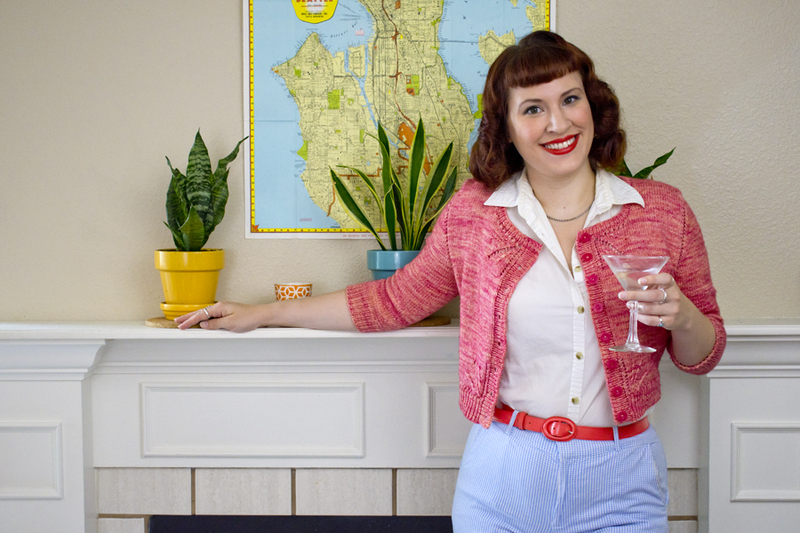 Totally random question–how do you get your buttondowns to fit so nicely under your sweaters? Whenever I try that, either with cardis or pullovers, I get a bunchy, terrible mess! Haha! It’s a reasonable question. The answer is that I pretty much only wear close-fitting sleeveless button downs, so I don’t have to fight with all of the fabric that comes with a woven sleeve cap, and there’s not much available to bunch. The ones that I’ve got with short sleeves are very lightweight fabrics that do end up bunching up a bit at times, but it’s not very noticeable because the fabric is so thin. This is truly gorgeous and I love that it’s in DK weight yarn. I’m definitely joining in once I’ve bought myself some wool. Also like that is in DK weight. Very nice!